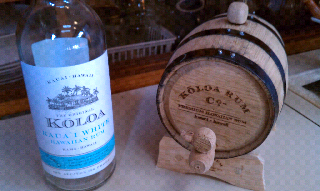 Stopped by a the Koloa rum distillery while I was on Kauai. I had actually already had a few sips of their gold rum that morning, so I was already feeling pretty good by the time we walked in for our tasting and tour. Sold. I already know how rum is made, but it's still fun to hear about it. Local sugar cane, some sort of local spring water, old pot stills. Sounds like a magical combination, and it is. The rum is pretty good. The rum cake was awesome, as were the various other rum desserts and syrups. Thing is, since they are pretty new, none of their rum is aged. The black and gold runs are colored and flavored that way. As part of the tourist/rum drinker trap, they had these one liter charred oak barrels for aging their rum yourself! Sold. I picked up a bottle of their white, which is already pretty tasty, ones of these barrels, and a rum cake (not part of the project, but it had been a little while since breakfast). I packed all these in my buddy's suitcase since I travel carry on only, well not the cake. I ate that in the car. Now that I'm back home on the boat, I decided to give the rum aging a go. After looking at the instructions, I decided it was a little more involved than I though and decided to put it off for a few days. First, I had to fill the barrel with water and add a purifier pill to clean it. After a thorough rinse, it was time to refill the barrel with water and let it sit for several days to let the wood expand and seal properly.... I almost forgot about it. Almost. Rum time. I drained it all out and filled it with rum. Turns out, the barrel holds a little more than a single bottle so i had to crack another open to top it off. I'm not a doctor, nor a rum aging expert, but I think it's important to get all the air out to prevent excess oxidation. Sounds right to me. Now I just wait. Supposedly, a smaller barrel ages a spirit faster than a full sized one due to the ratio of surface contact to volume. I thought I was going to have to wait a year, but now it looks like it might only take a month or two. I'll pour a taste after a month and see how it tastes. Best thing is, if this turns out nicely I can reuse the barrel! Maybe I shouldn't race my house?